An old method that is gaining popularity again is called Mitered Knitting. Many people are looking to expand their skills and learn new methods they can be creative with. There will never be a decline in the desire for home made crafts and gifts made by hand. While there are many people who love to knit, crotchet and sew with the standard stitches, we are beginning to see this stitch style of knitting is coming back. There are other names associated with this type of knitting. 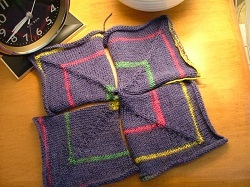 It has also been commonly named modular knitting, and domino knitting. Regardless of what you choose to call this type of knitting is comprised of various geometric shapes such as squares or triangles that have been put together in a sequential pattern one after the other joined by stitches that have been picked up from a previous shaped completed piece. These types of projects are often perfect for using all of that left over yarn you have from your other projects. These craft ideas are perfect for working in a great assortment of various colors. 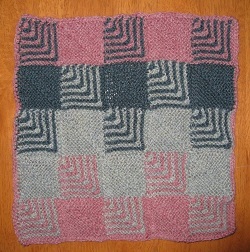 There is a simple concept to this basic pattern using knitting stitches that consists of using a six row by 4 row pattern with two colors that will become a square. It is usually done with a garter stitch which makes it easier for counting the ridges when you are continuing along with the pattern. There are many places online where you can find free patterns for this style of knitting projects. If you are looking for gift ideas for Christmas, birthdays, or christenings, you can find patterns for things like scarves and mitten sets, afghan blanket patterns, pullover sweater patterns, shawls and stoles, and often even simple dolls or toys. Once you have practiced and become pretty good with the simpler things, you can than began to create your own patterns. If you are talented enough you may begin to create new patterns for something others may like to have.